Peach Upside Down Cake was awesome. Even my husband loved this dessert. He’s not a cake lover by any means. In fact, he will rarely eat cake (even chocolate) unless it has fruit it in. But he loved this cake. 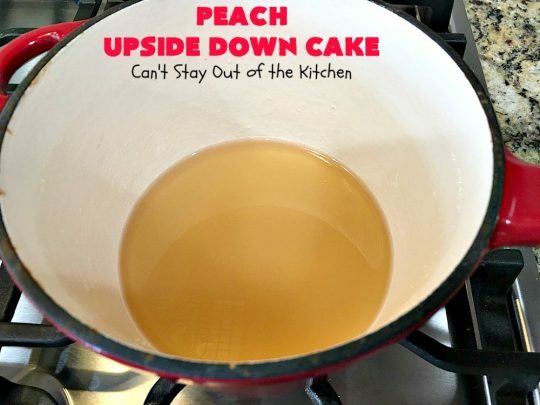 The interesting thing is this is the very first upside down cake I’ve ever made. Really. My mom never made them and I always thought they looked like too much work. 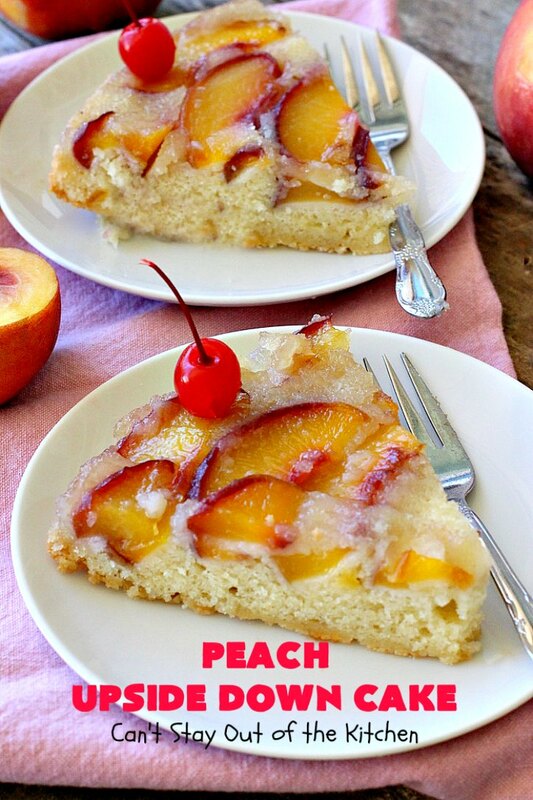 But really, this one is scrumptious and not overly difficult. I was looking online for recipes with which to use a boatload of fresh peaches. I found this recipe and thought I would give it a try. I looked through the hundreds of comments to see how others had fared and decided to make a few adaptions based on those comments. The nice thing about this dessert is you don’t have to peel the peaches before using them. Yay! You layer them in a parchment paper-lined baking dish. Then you caramelize the sugar with vanilla and water. This is not a syrup that you stir over hot heat. But you do have to shake the saucepan every minute or so while it cooks to make sure it thickens evenly. 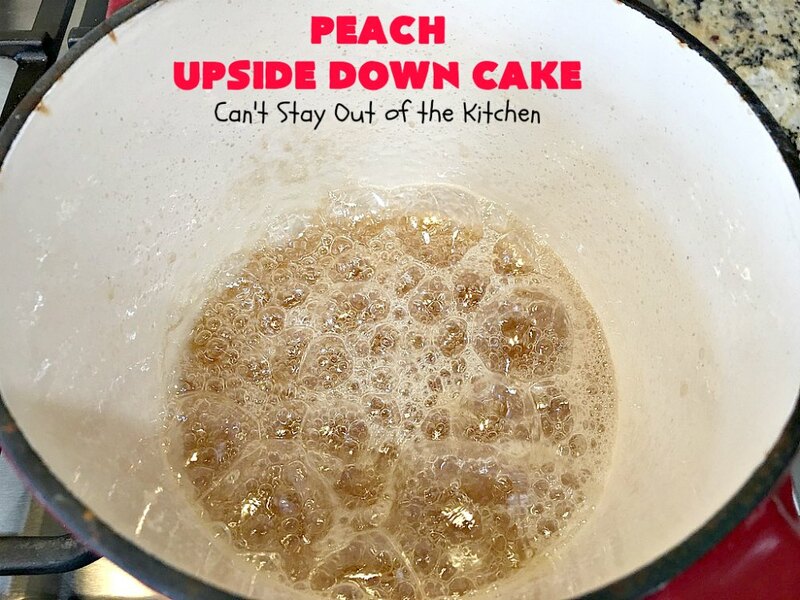 The caramelized sugar is ladled over top of the fresh, unpeeled peaches. Then a simple cake batter is poured over top. The cake has to bake a full 45 minutes before it’s cooked all the way through and the middle isn’t goopy. But, oh my, once it’s baked it’s so delicious. The cake is inverted almost immediately upon removal from the oven. Because it’s placed on parchment paper it comes out really easily. 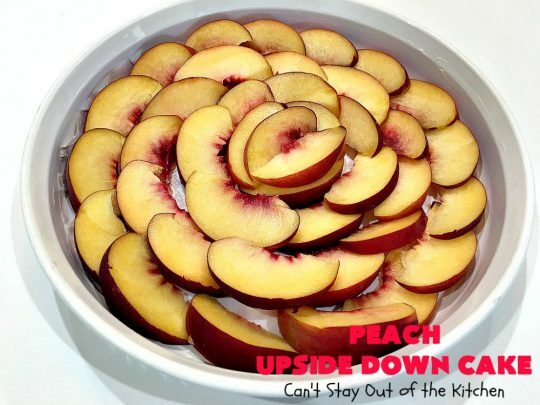 If you layer the peaches nicely, the top comes out looking quite beautiful too. 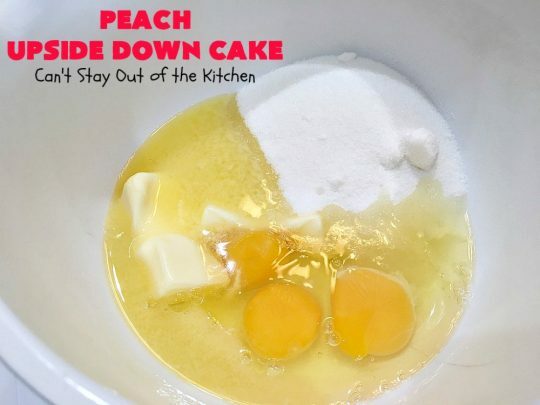 While the recipe sounds like it’s kind of involved, it’s really not. 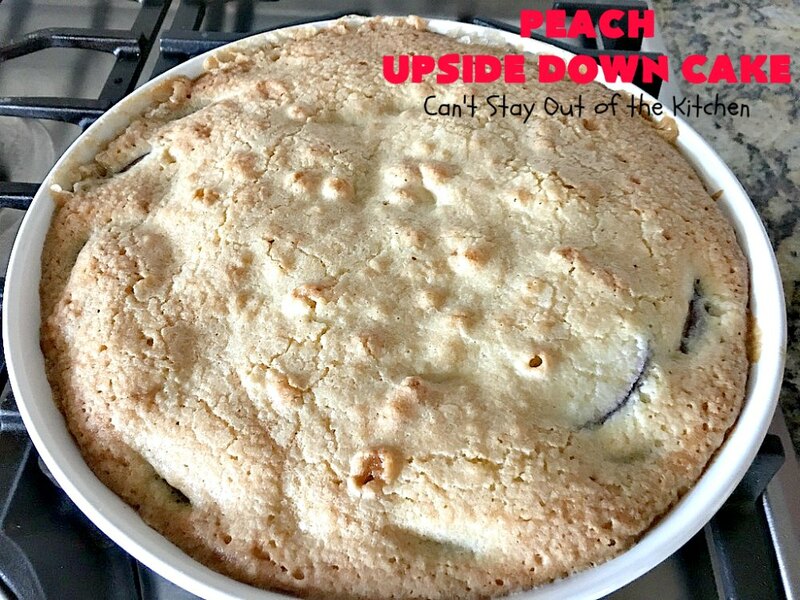 I also used the same basic recipe with fresh cherries and that one came out just as divine as this one! I gave one of these cakes to neighbors across the street. But because it was so good, I made another one just for us. 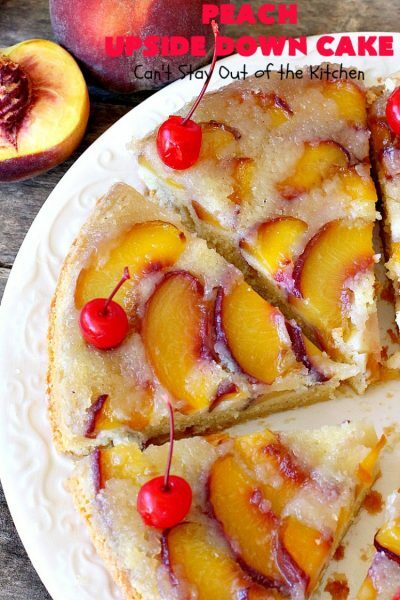 We were all drooling over this recipe. While I served it with Cool Whip, you can also serve this with ice cream if desired. I did not store this in the refrigerator and it was eaten up in a few days. This Peach Upside Down Cake is superb. 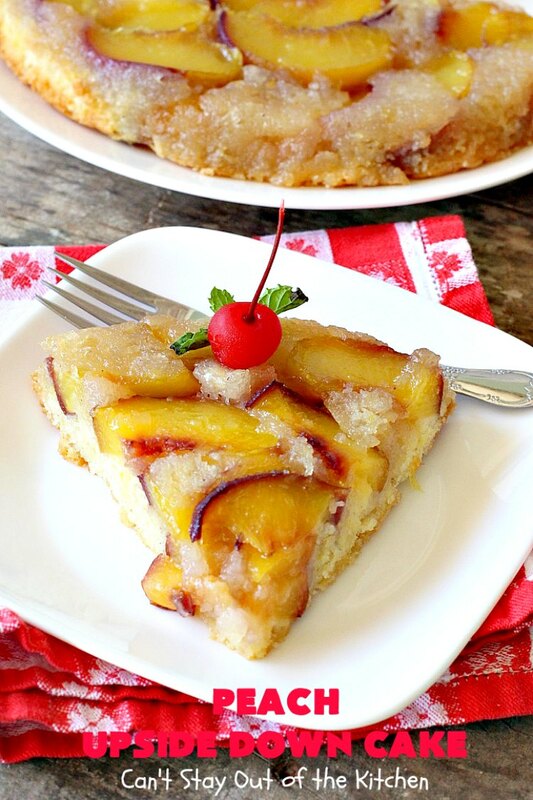 This is a terrific dessert to share with friends and family. Fresh peaches made this Peach Upside Down Cake spectacular. 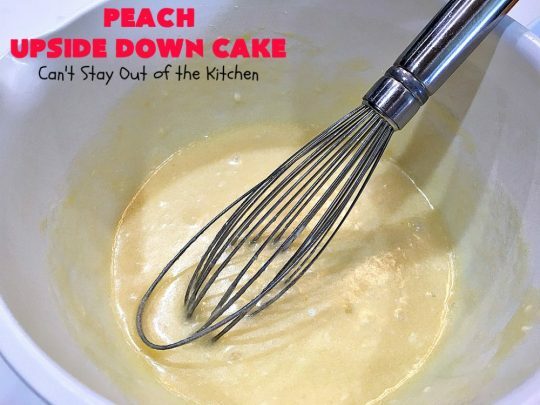 However, if peach season is over, you can substitute canned or frozen peaches if you make sure they are well dried before putting in the baking dish. I used these ingredients, plus water. 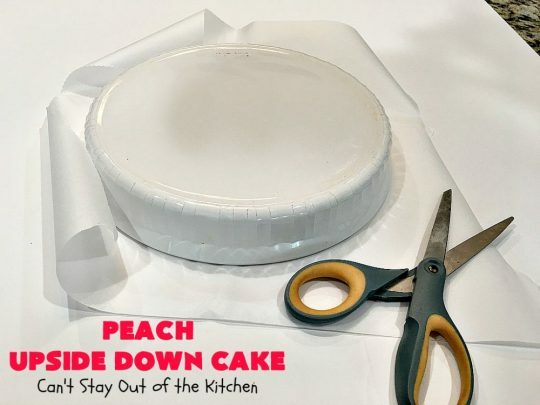 Cut a piece of parchment paper to fit the inside of your baking dish. Grease both the baking dish and the parchment paper with butter. Slice peaches in 1/8 to 1/4″ slices. You do not have to peel them. Layer the peaches in baking dish overlapping each other and on top of the greased parchment paper. Meanwhile, in a small saucepan over medium heat, add vanilla and 3/4 cup sugar. Add 1/2 cup water and stir once to combine. Don’t use anything to stir the sauce from this point on. Heat for 15 minutes bringing the mixture to a boil where it thickens and the sauce becomes amber in color. Every minute or two, lift the saucepan with a potholder and shake the ingredients in the saucepan. This will make sure it heats evenly and doesn’t harden. At 15 minutes, immediately remove from heat. 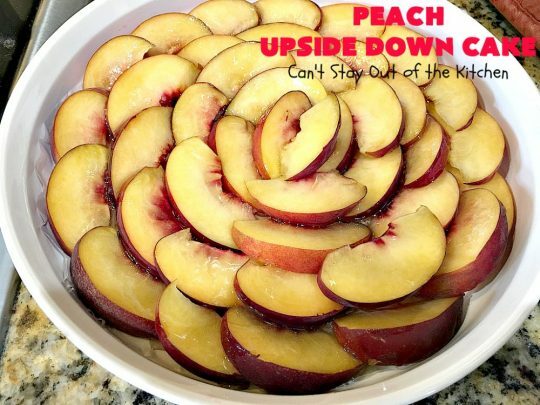 Quickly ladle the caramelized sugar syrup from the saucepan over top of the fresh peaches as evenly as possible. You have to do this pretty quickly or the sauce will harden up too much. Meanwhile, as sauce is cooking on stove, prepare cake batter. 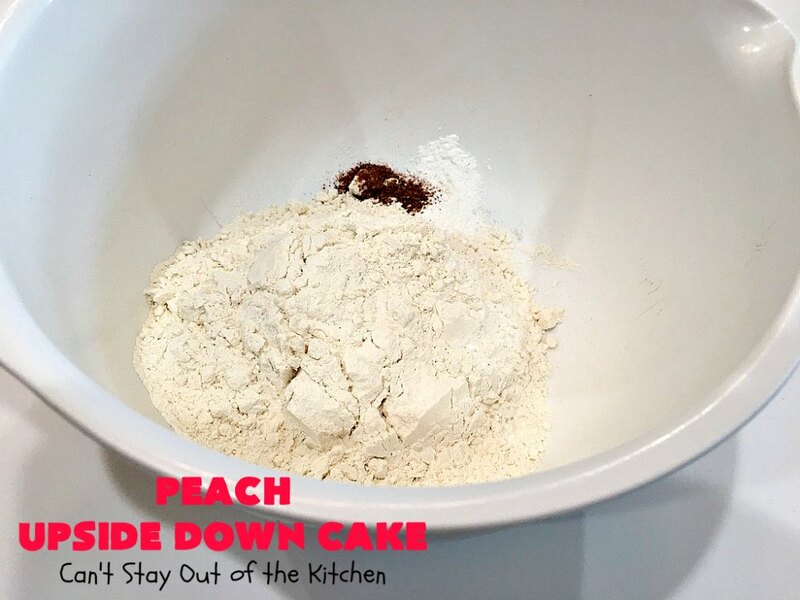 Place UNBLEACHED flour in a mixing bowl. (Bleached flour toughens baked goods). Add nutmeg and baking powder. In a separate bowl, soften butter. Add remaining sugar and eggs. Pour batter over top of peaches and caramel sauce in baking dish. Bake a full 45 minutes at 350. Otherwise the center will be goopy and not set up when you cut into it. With a knife, cut around the edges of the baking dish. 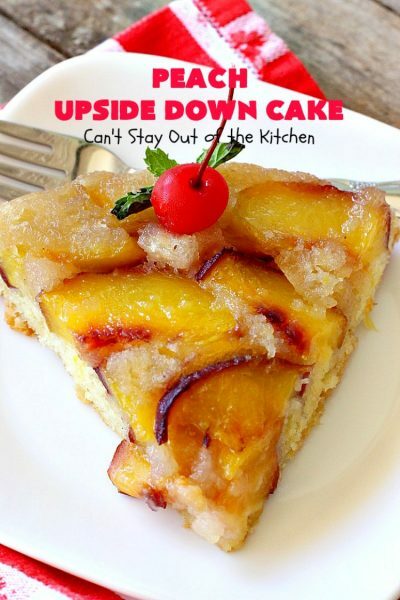 Invert the cake immediately onto a platter or plate. If desired, decorate the cake with whipped topping, maraschino cherries and fresh mint before serving. 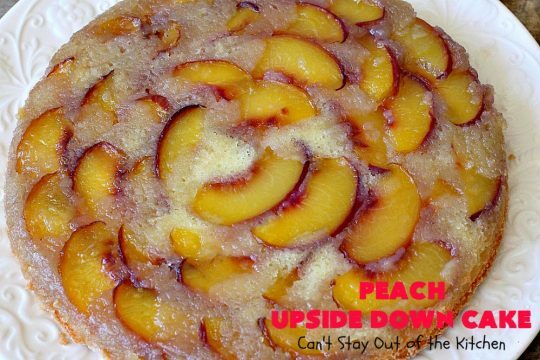 Peach Upside Down Cake is terrific for company desserts. 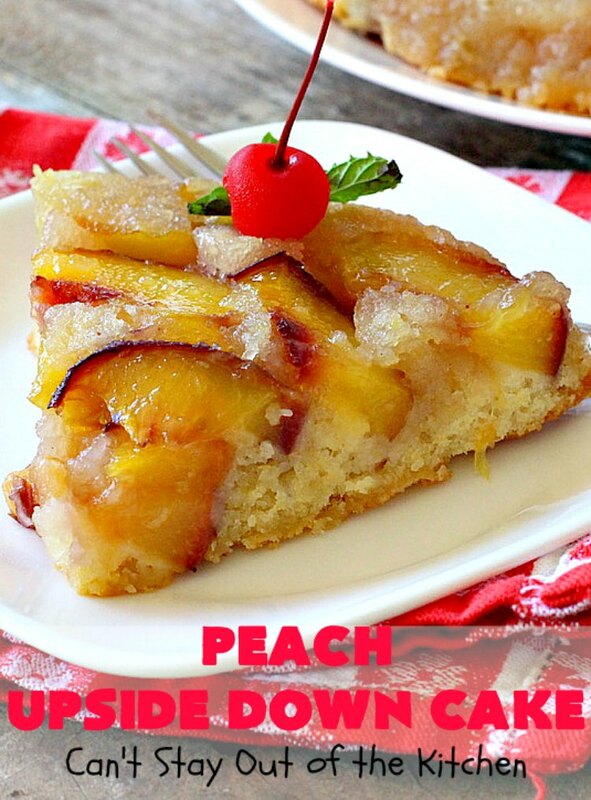 This is also a great dessert to make during the summer for Fourth of July and Labor Day picnics or potlucks when fresh peaches are in season. We drooled over every bite of this fantastic cake. 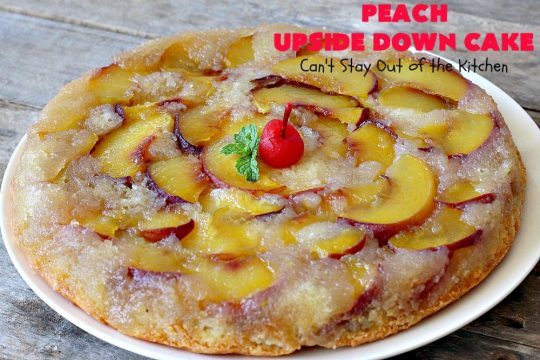 This lovely Peach Upside Down Cake has fresh peaches on the bottom. A homemade caramelized sugar sauce is ladled over the top. Then cake batter is poured over all. A true fan favorite, this beautiful and festive cake is absolutely heavenly and the perfect cake to serve company or for holidays. 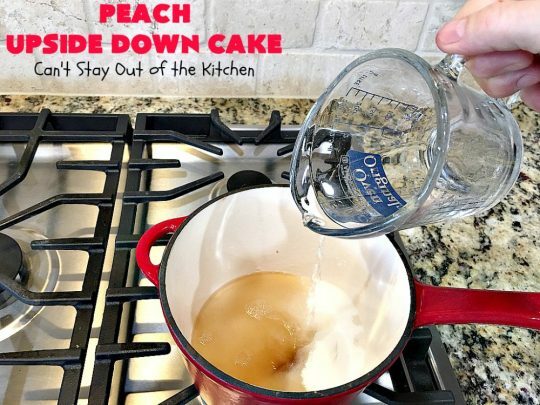 Place a 10-inch round cake dish on top of parchment paper. Cut a round from the parchment paper that will fit the cake dish. Butter the 10-inch round cake dish. Then butter the parchment paper as well. Pit the peaches and cut into slices about 1/8 to 1/4-inch thick. Arrange the slices in an overlapping pattern on the bottom of the cake dish. Combine 3/4 cup sugar, vanilla and ½ cup water in a small saucepan. Cook over medium-high heat until the mixture turns amber, about 15 minutes. 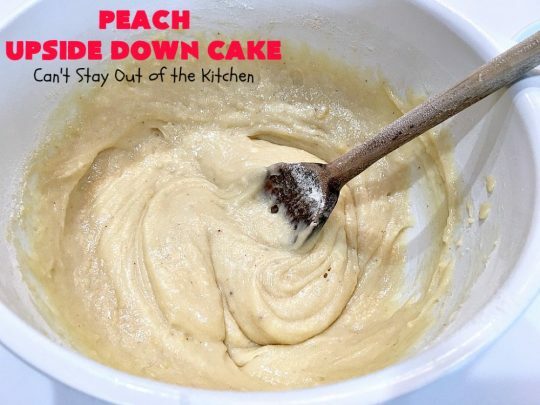 (Do not stir while the mixture is cooking but you may have to remove from heat occasionally and swirl the mixture). 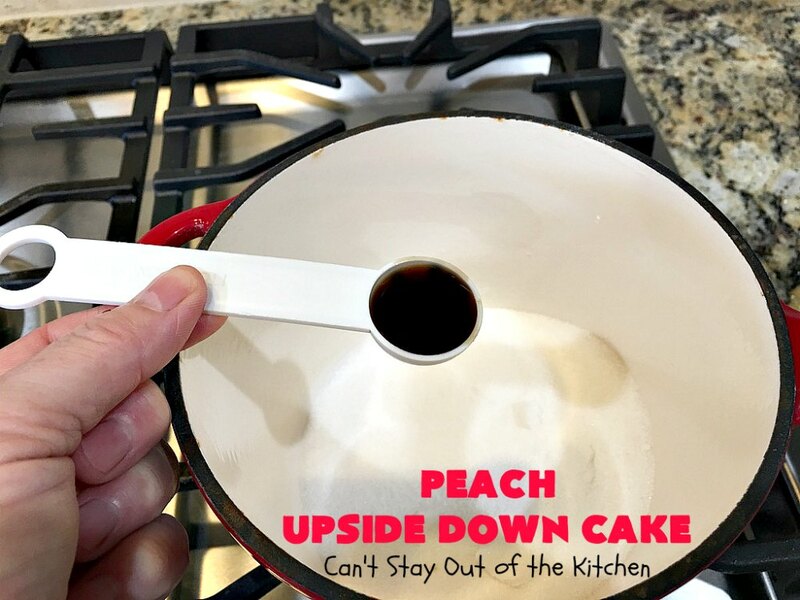 Ladle caramelized sugar evenly over the peaches in the cake dish. 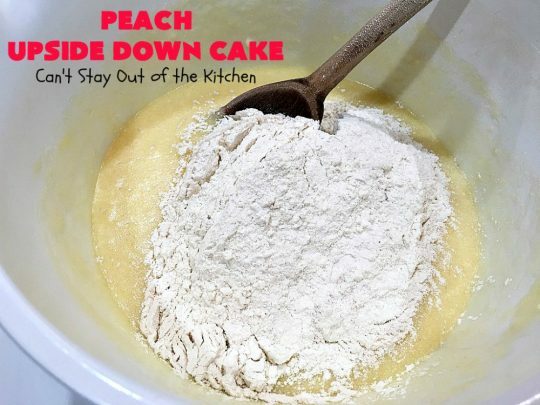 In a medium bowl, combine flour, baking powder and nutmeg. In another bowl, beat together the butter and remaining 3/4 cup sugar and eggs. 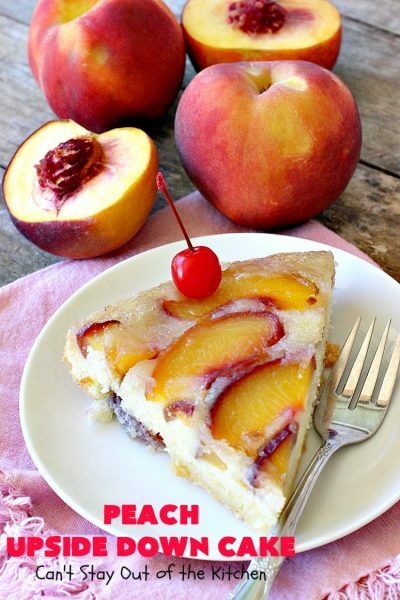 Spread the batter evenly over the peaches and caramelized sugar sauce. Bake for 30 to 45 minutes, or until cake is set and a toothpick inserted in center comes out clean. 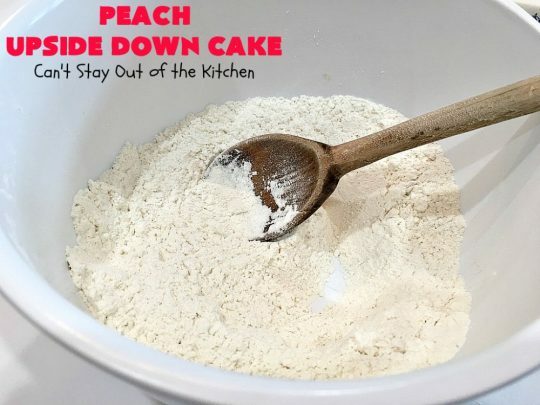 Remove cake from oven and set on a cooling rack. Run a knife around the sides to loosen edges. Place a platter or large plate on top of the cake. Invert the cake onto the platter. If any of the peach slices stick to the pan, lift them off carefully. Then replace them on top of the cake. This should not be refrigerated before serving. NOTE: Once you’ve hit 15 minutes on the caramelized sugar, you must ladle it over top of the peaches very quickly or the mixture will harden. (I started my 15 minute timer as soon as I turned on the gas from the stove top). NOTE: Refrigerate after two days. 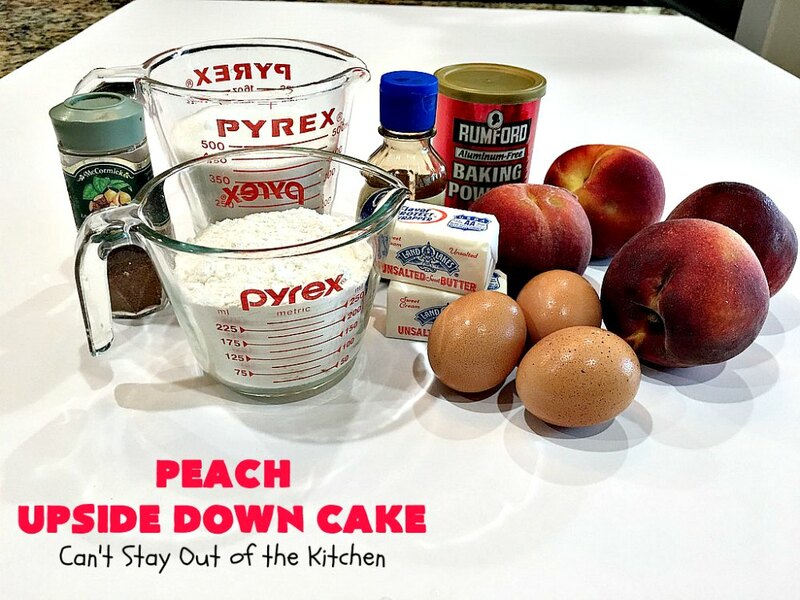 NOTE: I only needed 2 ½ peaches. NOTE: My cake took 45 minutes to bake until a toothpick inserted in center came out clean. 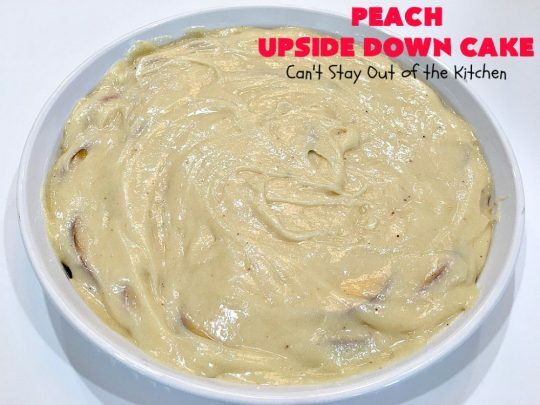 NOTE: To use canned or frozen peaches, make sure the peaches are drained and dried off thoroughly before using. Peaches courtesy of the Washington State Fruit Commission. Recipe adapted from Florence Fabricant, New York Times. 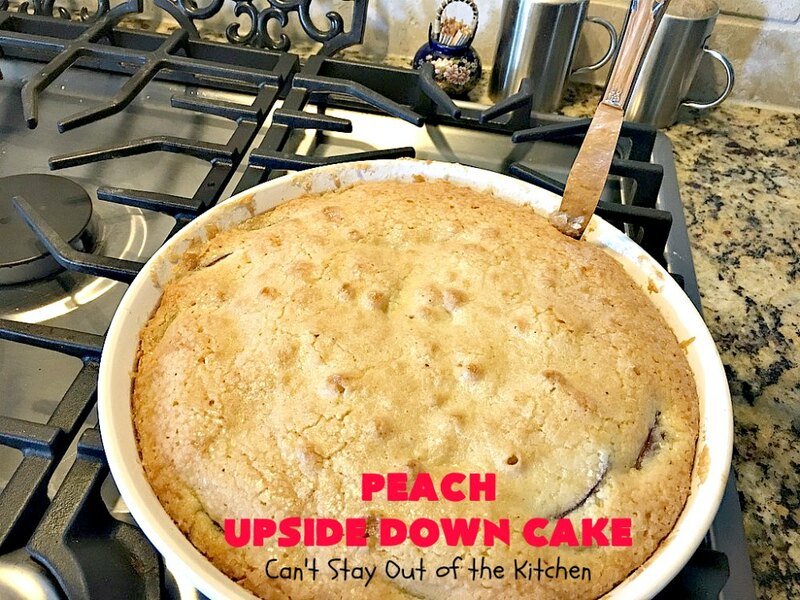 Peach Upside Down Cake is so good you’ll want to make it again and again. 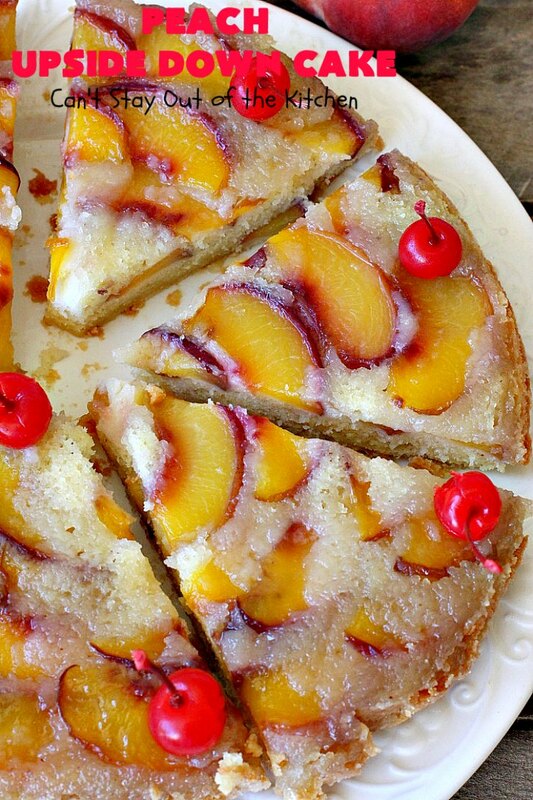 This beautiful and festive cake is perfect for holiday dinners. 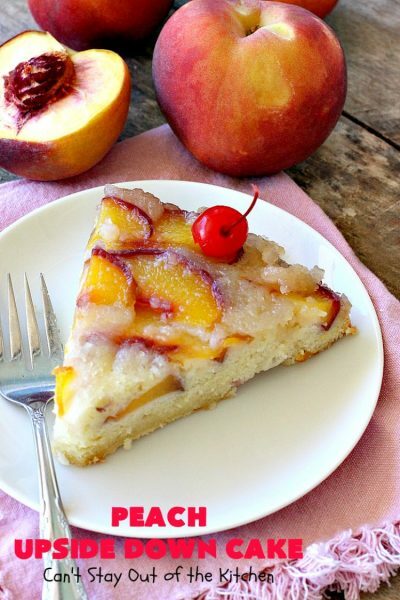 If you have a sweet tooth, you’ll love this Peach Upside Down Cake.